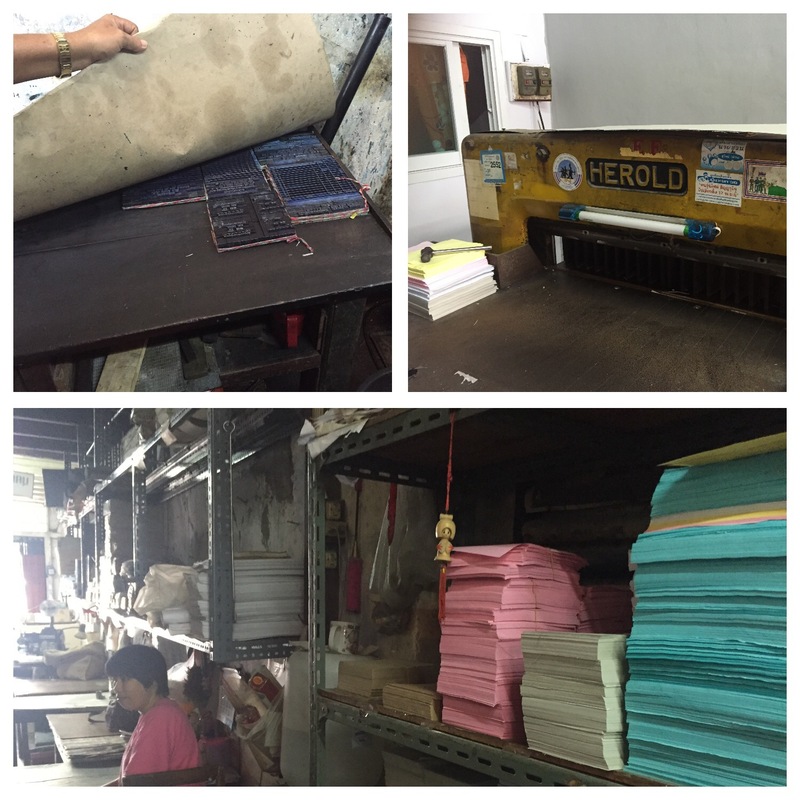 Visit to Phuket town and a printing machine for eternity – Go India, go future! It’s a rainy day in Phuket and when we walk through the streets of the old town many taxi drivers offer a trip to somewhere. Well, in the low season it might not be easy to gain some money… We just have refused again when we stop in front of one of these old printing houses in the old city. 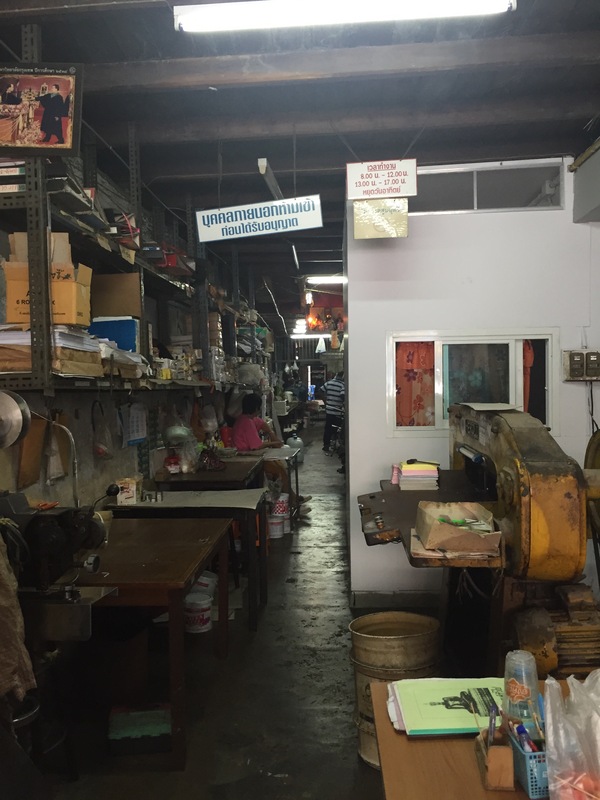 There are some of these printing houses close by, it seems to be the quarter of ancient manufacturing …. A few meters away we had seen some men producing and selling amulets in a small street. The door is open and from insight we can hear the noises of machines. The taxi driver who just a minute ago talked to us joins us again and with a smile in his face he asks if we are interested to have a closer look. “Friend of mine, good man”, he says and makes us enter. 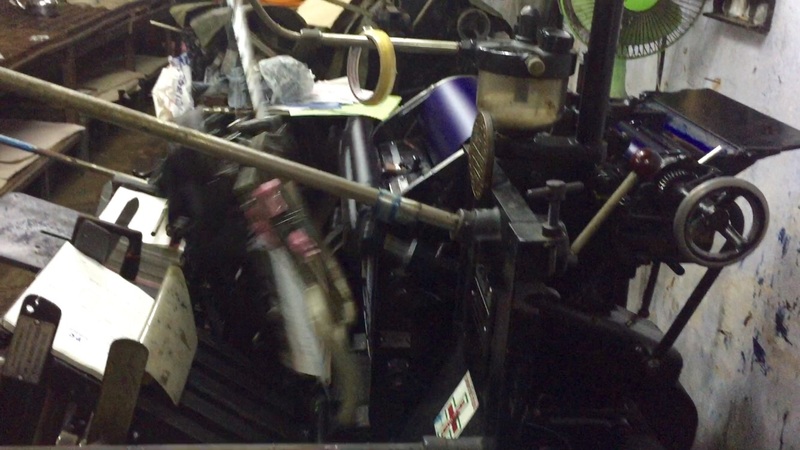 It is a long, small room, first a cutting machine, then a small corridor where a woman is counting some paper and then three, four old printing machines – one besides another. The printing man welcomes us and proudly demonstrates his work. The first machine in the room is working, in a loud, rhythmic manner – uff, tschum, bum, uff, tschum, bum – one form after another is printed. The empty paper is sucked by a vacuum stick, put into the right position, the inking roller is covered with a new layer of colour, then the paper is stamped and mechanically taken to a pile where it shortly dries before the next sheet is added. It is an old Heidelberg printing press, one of those which at least thirty years ago in Germany were substituted by the modern computerized ones. “Heidelberg machine,” he says, “from Germany. Good machine. Always works.” When I ask him if there is a lot of work, he nodds:”Yes, Ma’m, lot of hotels need forms. Very good quality. It’s all manually done. And we can repair by ourselves,” he adds. That’s true. This compact, stable and iron printing press is made for eternity. Something we easily forget that machines could be used for many, many years … and for sure miss in our modern lives. The taxi driver and the printing man show us many details before we leave. I think they enjoyed our visit, as we did, too.